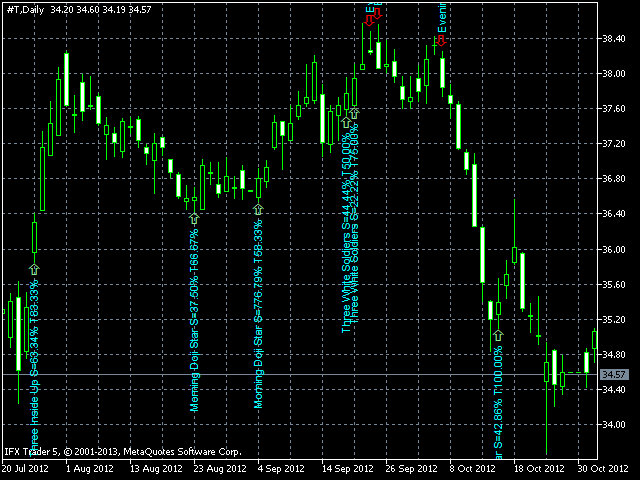 ACPD – «Auto Candlestick Patterns Detected» - The indicator for automatic detection of candlestick patterns. The indicator is useful both for novice and professional traders. It can be used as an independent tool (good results can be achieved on stocks and currency pairs) and as an additional tool to a trading system. 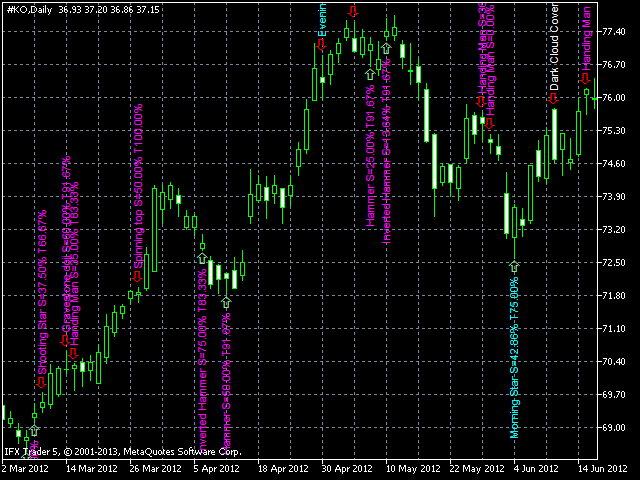 Determining 40 reversal candlestick patterns by their main parameters; it displays over 40 signals based on these models. Each signal is displayed with an arrow above or below the last candlestick in a model, direction of the arrow indicates the forecast direction of movement of the chart. The indicator includes 10 patterns based on one candlestick, 10 patterns based on two candlesticks and 20 patterns based on three candlesticks. Depending on the number of candlesticks in a pattern the caption text has different color (can be set in the parameters). Each caption of a pattern indicates: its name, the strength of the "S" signal (calculated in percentage terms using an empirical formula) that shows how close is the pattern at an ideal one, and the trend coefficient "T" (calculated on the basis of three candlesticks using a score system) that shows how close it the trend to an ideal one. The indicator includes the feature of disabling any of the patterns. If you don't need to detect a patter, simply disable it. 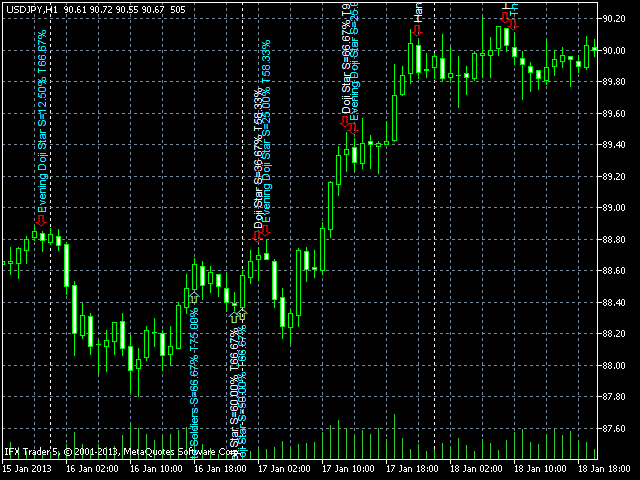 The indicator also features the possibility to adjust some parameters of the patterns. Thus you can adjust the indicator depending on the volatility of the instrument and control the visual deviations depending on the timeframe. 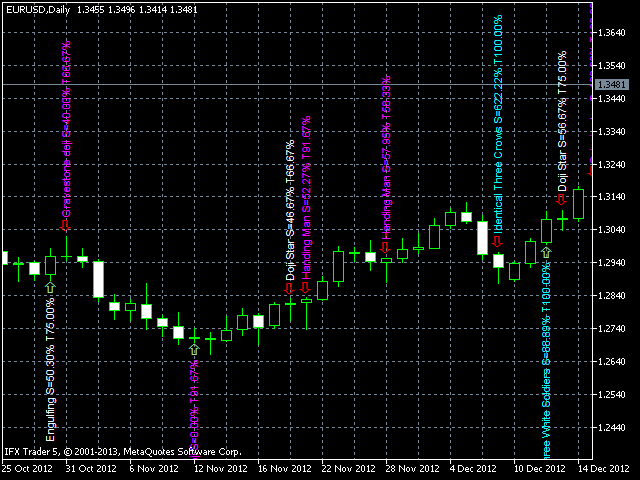 The indicator settings are optimized for EURUSD (4 digits) and D1 timframe. However, these settings are good for other instruments and timeframes (above H4). The indicator works with the following objects: ARROW_UP, ARROW_DOWN and TEXT. 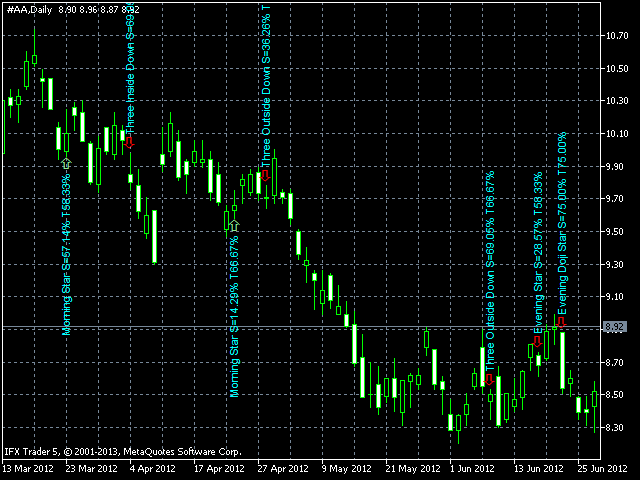 When removing the indicator from a chart, it will delete all objects of these types. Buffer candles for scanning – buffer of candlesticks that is used for searching for patterns (recommended to set a value from 10 to 100, values more than 100 may slow down the system). Color down arrow – color of the down arrow. Color up arrow – color of the up arrow. The text color of single candlestick patterns – color of the caption for one candlestick patterns. Text color double candlestick patterns – color of the caption for two candlestick patterns. 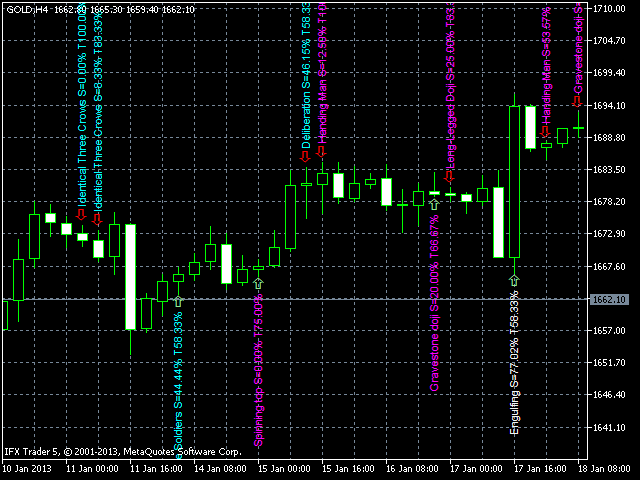 Text color triple candlestick patterns – color of the caption for three candlestick patterns. Text size – text size. Text font – text font. Coefficient of trend detection model – coefficient of trend to start searching for patterns. Shadow Umbrella Up (unlike the body) – maximal shadow of an up "Paper Umbrella" candlestick relative to the body (for the Hammer and Hanging Man patterns). Shadow Umbrella Down (unlike the body) – minimal shadow of a down "Paper Umbrella" candlestick relative to the body (for the Hammer and Hanging Man patterns). Umbrella body min (tick) – minimum size of the body of a "Paper Umbrella" candlestick in ticks (for the Hammer and Hanging Man patterns). Shadow difference Spinning Top – maximum difference between the shadows of "Spinning Top" (the parameter is greater than 1). Spinning Top body min (tick) – minimum size of the body of the "Spinning Top" candlestick in ticks. Shadow difference Doji – maximum acceptable difference between the shadows of "Doji" (the parameters is greater than 1). Shadow Doji max (tick) – maximum size of the shadows of "Doji" in ticks. Doji body max (tick) – maximal size of the body of "Doji" in ticks. Shadow Gravestone Doji Down max (tick) – maximum acceptable lower shadow of the "Gravestone Doji" in ticks. Shadow Doji Dragon Up max (tick) – maximum acceptable upper shadow of the "Doji Dragon" candlestick in ticks. 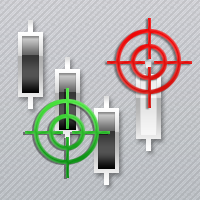 Shadow Doji Four Price max (tick) – maximum acceptable shadows of the "Doji Four Price" candlestick in ticks. Body Long Candle min (tick) – minimal body of the "Long" candlestick in ticks. Divergence Meeting Lines max (tick) – maximum of the "Meeting Lines" candlestick in ticks. Shadow Maribozu Candle max (tick) – maximum acceptable shadows of the "Maribozu" candlestick in ticks. Delete old objects – delete old object mentioned above. Other settings are for enabling and disabling detection of the patterns. Would have been a good idea to have provided a visual indication as to whether the recognized candlestick pattern is by convention indicating indecision, bullish/bearish trend reversal or continuation trend in the market. Very good app for associating the name with the visual appearance of the candlestick patterns provided for by the app.